Bit mine is already trying to direct play it and that's where it appears to be getting stuck, so not sure how a backend fix helps me? If I try and play one of my older rips which has DTS or some other non supported audio for Chromecast emby will auto transcode and the video will appear and play fine first time. One thing I have noticed is I can't delete a movie from within emby, doesn't look like I have permission, might just be a red herring. You will have to make sure the emby server process has privileges to delete files from your media folders. I've tried again, same problem. How do if force direct play on Chromecast, can't see option to play original quality? Thought perhaps trying to start in transcoding mode and then switch back to direct play while playing, if such an option exists. Edited by Saltyzip, 10 November 2017 - 06:44 PM. Double check your in app Chromecast bitrate setting and then if it needs adjustment please try again. Please attach the emby server log from your latest attempt. All the video settings in the app are set to default which is auto, there is no play original quality worded setting to choose like there is in Plex? 5. Pressed pause button on player in Android Emby app - which actually kicked off chromecast playing the movie, but now transcoding, not direct playing. Edited by Saltyzip, 11 November 2017 - 10:41 AM. This video did actually start out direct playing, but the chromecast video player raised an error and so we did what we always do in that situation, which is automatically switch to transcoding. Thanks for the sample. I am able to direct play it to chromecast without any problems. Is there some aspect of your network that we should know about that might be interfering? E.g. proxy, vpn, security software, etc. I'm experiencing the same issue as OP. Windows 10 Pro hosting the Emby server, Emby app for Android, Chromecast Ultra. 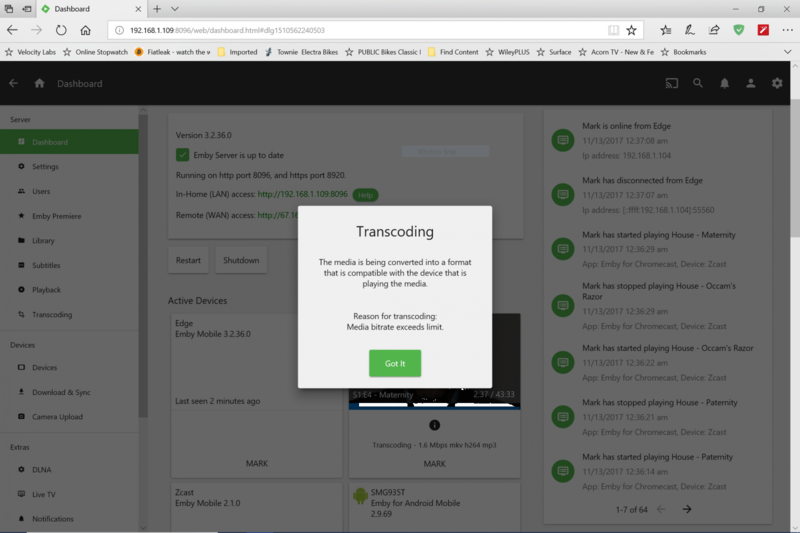 Most files are playing fine, but I have some mkv files with H264 video (standard definition) and AAC 6ch audio, that when casted show "Direct Playing" on the server dashboard, ffmpeg is loaded and terminated repeatedly (according to resource monitor), no video plays through the Chromecast, which just shows the background image for this particular tv show. The play button quickly cycles through play/pause in the app and I am unable to stop it. In fact, when I hit stop, the dashboard switches to show it as transcoding, but It then usually goes back to showing direct play. The same file plays successfully on the phone and in a desktop browser. I've attached the server-log and the last four ffmpeg-transcode logs created. It keeps creating those each time it restarts ffmpeg. Edited by mawazi, 12 November 2017 - 04:47 PM. Glad I'm not the only one having problems. My windows server running emby has only the standard windows defender and firewall in situ, all running on standard home type network. Edited by Saltyzip, 12 November 2017 - 02:48 PM. I've come to the conclusion this is a bad Chromecast dongle. I can play the video on another chromecast on my network without issue. But any device I try to play a certain file, it gets stuck in a loop only on that chromecast device. I have not looked into it further, but I did do a factory reset on the one chromecast and still can't get it to work fine with some episodes. But again, it's only that chromecast, all the others work fine. @Luke, is there something I can look up for logs for the chromecast or some trick to remove any updates google did to it to start from scratch? For anyone else, I would try a different chromecast if you have one and see if it still comes up with the same error. Not sure if this helps the dev's or not. But I am finding that my one Chromecast for some reason has a "Preview Program Firmware" ver. 1.28.10055 Installed even though I am not signed up for it. But my other Chromecast's that are working fine with the mkv files have the regular 1.27.96538. Friend of mine is having the same issues and asked him what version he has and he also has a "Preview Program Firmware" installed, but did not sign up for it. Not sure if this is the problem or if it helps. Just figured worth noting. That's interesting info, thanks ! Both my chromecasts are running on preview firmware too, the version is shown in my original post. Well if the preview firmware is the issue, then we at least know it's not emby. No consolation, but narrows down the problem. Seems to only be with mkv files (at least some of them), unfortunately going to have to wait for a new firmware update or buy another one and double and triple check that I didn't sign up for the preview version. Not a fix, but helps a little with knowing what the problem probably is. My Ultra is also using the preview firmware, though I'm not signed up for the preview program with Google. Unfortunately, there doesn't seem to be a way to roll it back to test it, nor is there a log file that I can view (that I know of) to see when the firmware was updated. Would the Chromecast firmware cause these types of issues? The ffmpeg loading and terminating repeatedly issue and so forth? Because I have some mkv files with h264 and aac streams that still play just fine. Tried doing a factory reset of the Chromecast, but no luck, same issue. Don't know if it matters, but when I cast the video to Chromecast and the dashboard shows direct play even though nothing is playing, the informational "i" button is above the direct play, when I click on it a small white empty box appears with the "Got It" button at the bottom. No actual information. Some new data. When I remux the mkv file with a copy of the video stream but transcode the AAC 5.1 audio to AAC Stereo, the file direct plays with no problem. If I do the same but transcode the AAC 5.1 back into AAC 5.1 (same codec, re-encoded), it fails as before. So, for some reason, mkv+h264+aac5.1 is a no go. I tried re-encoding the AAC 5.1 into OPUS 5.1, which plays (claiming Direct Streaming), but is actually re-encoding the OPUS into MP3 Stereo according to the ffmpeg log.